Buddhism has flourished in Korea for more than 1600 years. During the Three Kingdoms Period (57 B.C.E. – 668 C.E. ), and later, in the Unified Silla Period (668-935), it played a preeminent role in cultural development and became a unifying factor and the grounds for further national and cultural flourishing. Korean Buddhist temple cuisine is very closely related to Korean royal court cuisine because it developed under royal patronage. The only acceptable in Korean Buddhist temples animal product is milk, therefore its cuisine is based on fresh vegetables and herbs, excluding garlic, green onions, wild leaks, wild onions and asafetida which are called “hot” in flavor. The reason of that is to preserve the original taste and flavor of the main ingredients. It is believed as well that those vegetables, when fresh, affect our thinking and lead us to obscene thoughts, and when cooked, they stimulate our anger. The kimchi made in Korean temples is unique in taste according to less amount of salt used for its fermentation process. 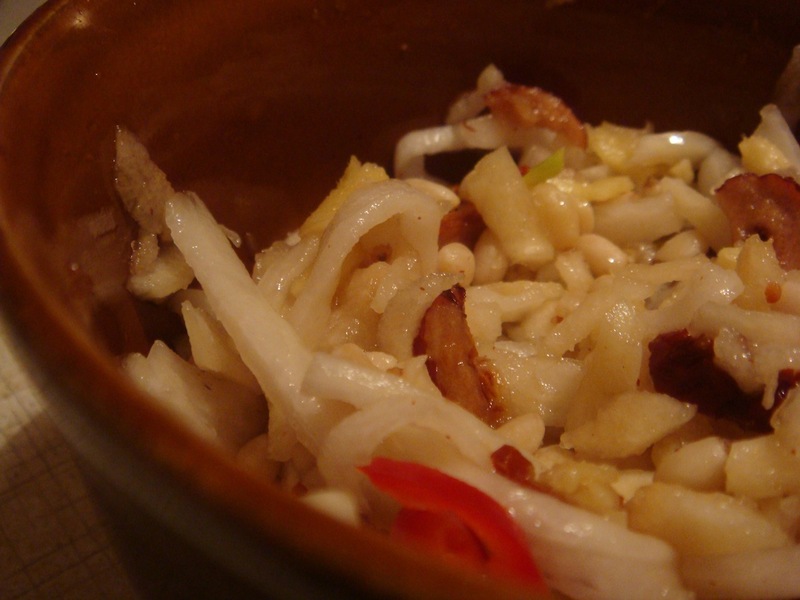 There are few types of temple kimchi. 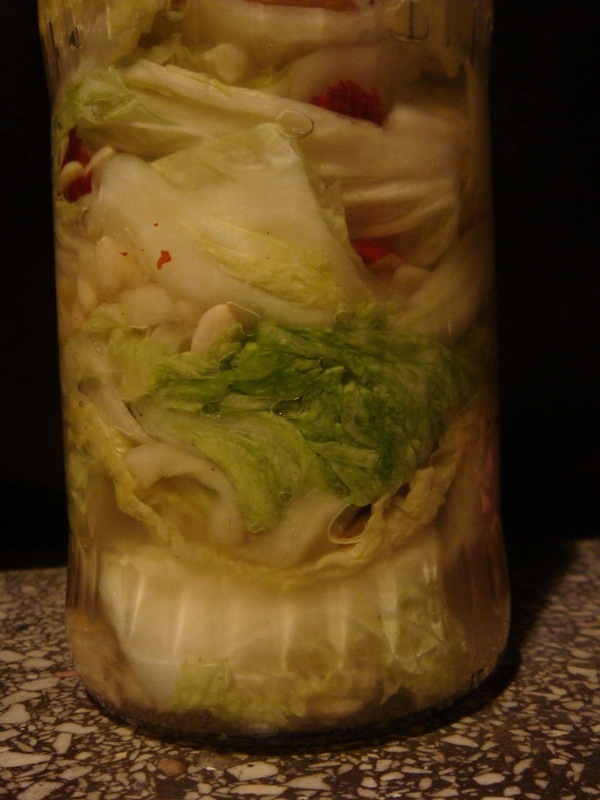 The one I’m going to make is lightly flavored with pine nuts and thanks to its recipe, which doesn’t contain red pepper, is called Baek kimchi 백김치 (white cabbage kimchi). 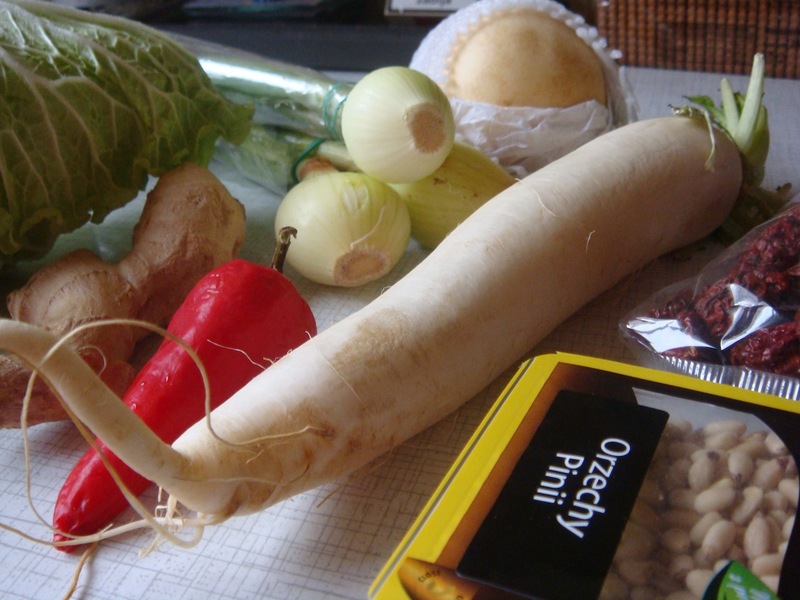 Although on a picture below you can see some onions, the only vegetable added by me to make the recipe modern is garlic. The original plan was to use onions but eventually I decided not to include them in the recipe. 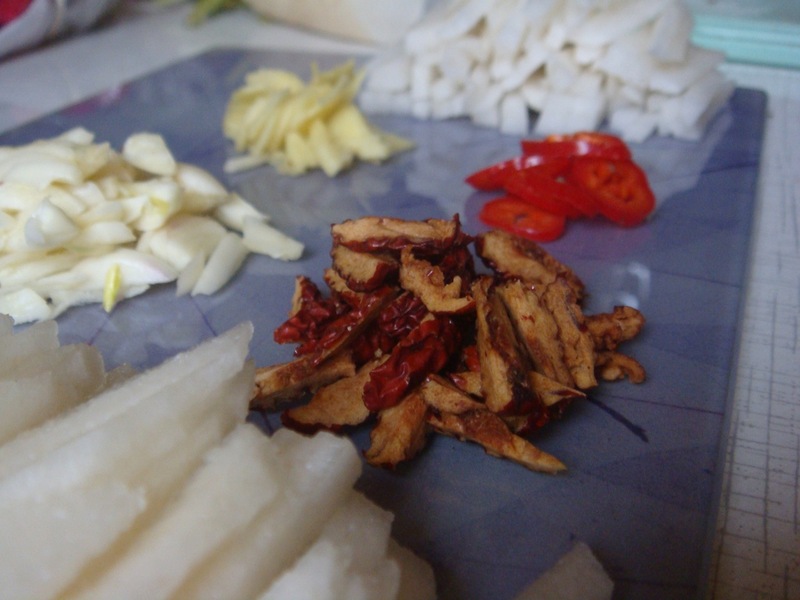 2,5cm of ginger (cut into thin slices). Dissolve 1 cup of salt in 8 cups of water. Make a cut on the bottom of the cabbage and half it with your hands. Use remaining 1/4 cup of salt to sprinkle the cabbage leaf by leaf. 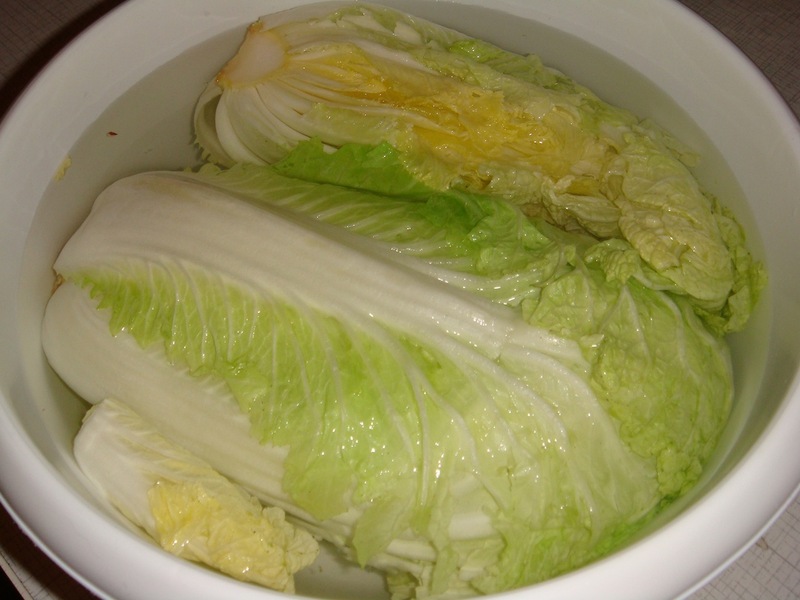 Place the cabbage into salt water for about 8 hours. After that, wash the cabbage under running water and drain. Place radish in the same water for about an hour. Wash it under the running water and drain. In meantime you can mix the sauce ingredients. Spread cabbage with the sauce leaf by leaf, exactly the same way you did with the salt. Put the cabbage into a container. Fill it with salt water.